I started off my weekend with a great morning at the RFTC. My first time running it was in 2005. 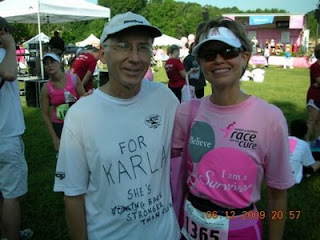 Karla and I had just been training together for about a month and she wanted to run the race in celebration of her mother who is a survivor. I had just run in the Darkside 8 hour track ultra the weekend before but decided at the last minute to show up for this one. There was a womens only race that year so Karla and I didn't get to run together. I ran the open race later in a decent time and we had a good time enjoying the post race activities. We had no idea how just a year later how much more meaningful this race would become for her or our friendship. In early 2006 she was diagnosed with cancer and we would run the race together while she was in the middle of chemotherapy. But that was three years ago and she is in great shape now as we are once again training hard and hoping to improve her pr's at all distances and return to Boston qualifying form. The format for the races have changed over the years and this year there was a seperate competitive 5k that started at 7am. We would be running in this one but not together this time. It was tough not to run with her but I wanted to test how my training was going so we decided to go on our own. Before the race we had a nice time chatting with the large group of running friends from the NCRC team. With 20 minutes to go before the start we went to warm up with Lisa Howell who has been joining us on our long trainng runs for a while now. It was a warm humid morning and we were already working up a sweat but hoped it wouldn't be a problem for the short distance. The race went fairly well for me. Lisa and I were side by side for the 1st mile which I hit in 7:06. That was encouraging because I had hope to run under 23 minutes but then the 1st mile is the easiest of the race. Lisa fell off the pace but I pushed on as we begin to hit the hills. There are no really long or steep hills but several small hills that make it hard to sustain a fast pace. I slowed down to a 7:33 2nd mile but still felt ok. As I started the 3rd mile though the hills and humidity were working on me and despite my efforts, I slowed down a lot that last 1.1. Finished in 23:26 and was satisfied with that time considering the training I have been doing. Lisa would finish about a minute later and get herself a PR and not much further back was Karla. She ran 25:07 which is amazing considering we ran 27:03 in Clayton just a month ago. We waited at the finish for Frank to come in and then went to cool down and socialize some more. Later that afternoon I got a message from Karla saying she had good news. Turns out she won 1st place in the survivor category! Too bad we didn't wait around for the awards ceremony so she could have been recognized. I am very very proud of my dear friend , training partner and Marathon Princess! !